Should I Get a Wall Bed for My Apartment? Apartment living is becoming the norm. Our world grows increasingly smaller and compact. More individuals are moving towards the urban lifestyle and away from big spacious homes in the suburbs. Add to that the increasing number of multigenerational family units, where grown children or elderly relatives may choose to stay with other family members both for financial reason and for support. This means that increasingly we are embracing apartment living as a culture. As an apartment dweller, you need to maximize space, and one way to do this is through a wall bed. While the name may have you envision sleeping vertically against a wall-papered surface, the reality is that wall beds are an ingenious invention. Also known as Murphy beds, wall beds instantly transform any living space into a comfortable bedroom with the push of a button. This option allows you to be creative and stylish with your space. Using it as a fun entertainment center during the day and a place for restful slumber at night. The biggest benefit of having a Murphy bed is the space that it saves. And saving space means that you can do more with your small urban dwelling. Be creative in your floorplan, integrating bookshelves and drawers with your bed unit. This allows you to truly transform the space for a variety of uses. Pull the bed up and pull out some folding chairs and a table. Then pack these away and sleep in your bed. Make the most of your apartment without sacrificing space. By saving space you will also save money. Why? By allowing your home multifunctionality you will be renting a smaller space. This will save you money in rent. When you add up all the other costs of having an extra bedroom to maintain like energy costs, extra furniture, or even cleaning the room, you will find that having a wall bed will save you hundreds, maybe even thousands, over the years. Additionally, these beds are very easy to assemble and maintain. Their ease of functionality adds to their comfort. 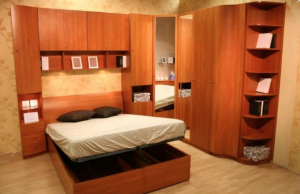 If you own a condo or even a house that needs an extra bedroom, opt for the Murphy bed instead. Instead of costly constriction for an extra bedroom or wing to your home, you can simply customize a wall unit that incorporates a comfortable bed, drawers, and beautiful shelving. You don’t have to ask visiting friends and family to sleep on your couch or air mattress or pay for the cost of an extra hotel room. Just have them use your convenient Murphy bed. Being green is the wave of the future. Less is more. You can be stylish and urban with your creative living space. There are a variety of design options to showcase your individual taste. Speak with a specialist about what your needs are. Customize your space, minimize your costs, and maximize the comfort of your urban home.